Guide on how to copy DVD to a new DVD disc or to Windows (10) computer with best DVD copy software for Windows 10/8/7. It's so good to know that more and more people are aware of backing up DVD in such a way as to prevent the source DVD from losing or being scratched. One of DVD backup schemes is to copy DVD to VIDEO_TS folder. VOB files in VIDEO_TS folder thereby can be played on VLC, 5KPlayer or other common players directly and further burned into DVD. Generally, the folder copied from DVD optical disc contains both audio and video files, namely, AUDIO_TS and VIDEO_TS. 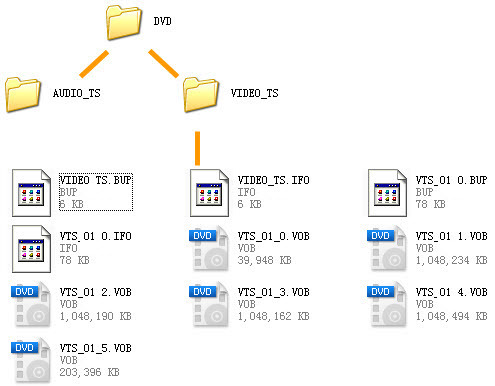 VIDEO_TS, composed of IFO, BUF and VOB files, is the most important composition in this DVD folder. IFO file: the file for recording the information of DVD and current title, through which the DVD information is obtained by some software based on the data recorded thereon. BUF file: the backup of IFO file. In case that IFO file cannot be read, IFO is the alternate. But if both IFO file and BUF file are not readable, the DVD cannot be played. VOB file: the video file of the cloned DVD folder with file extension ".VOB", divided into several files each not larger than 0.99G. How to Make Use of VOB File? VOB, short for Video Object, is a container format containing video, audio, subtitle, menu and navigation contents, based on the MPEG program stream format. VOB file can be used for storing all MPEG-2 formatted audio and video data, which not only includes movie itself, but frames for menus, buttons and sub-picture stream of multiple subtitles. Why Do You Need to Copy DVD to VIDEO_TS Folder? VOB can be played on 5KPlayer, WMP, KMP, PowerDVD, and RealPlayer, and is even played greatly with VLC player. Besides, VOB file can be further burned into DVD to realize DVD to DVD backup (for personal use only). In order to play VOB file by these players or burn VIDEO_TS to DVD, you need to copy DVD to VIDEO_TS folder at first. WinX DVD Copy Pro is an excellent DVD to VIDEO-TS folder copy tool for its special function for cloning DVD to a folder containing VOB file. The principle is cloning the content of DVD VIDEO_TS folder onto hard drive of computer while decrypting. 1. Sector-by-sector mode: has successfully changed the traditional way of remaking and reediting DVD into a new breakthrough of copying and decrypting DVD by sector -- thereby guaranteeing 1:1 original output effect and fast speed. This mode gives a second life of old broken DVDs in your collection. All content can be copied to VIDEO_TS folder flawlessly for later burning to a new DVD disc. 2. Supporting bad sector: jumping and trying to fix the bad sectors automatically -- cloning DVD with corrupted sectors generated both carelessly and deliberately, for example, by Sony ARccOS. 3. Removing Disney X-project DRM: checking the most complicated Disney's fake to successfully back up a 40GB+ DVD with 99 titles. 4. Eliminating all copy protections (not for commercial use): has and will be continuously updated to support all latest copy protection technologies. How to Back up DVD to VIDEO_TS Folder with WinX DVD Copy Pro? Free download, install and launch WinX DVD Copy Pro and follow the simple steps below to copy DVD to Video_TS folder in Windows (10). Step 1: Import your source DVD, which can be DVD movie, episodic DVD movie, TV series and music DVD. Step 2: Click "Browse" to choose the proper place for the target folder. WinX DVD Copy has already made the default choice for you. Step 3: Click "Run" to start! This software will automatically read DVD and fix the bad sectors without manual setting. So all you have to do is waiting for the completion of copying the whole content of DVD to VIDEO_TS folder. Besides copying DVD to VIDEO_TS folder, WinX DVD Copy Pro can also back up DVD to ISO, clone DVD to single MPEG2 file with original video tracks and original surround AC3 audio. It can also back up main title and chapter, etc. Part 2How to Backup DVD to VIDEO_TS Folder?